At The Fishbowl (on Granville Island) until February 18. Sold out for the rest of the run. Realtors have bumped lawyers (except for her lawyer brother) into second place on the list of professionals that Toronto actor/writer Karen Hines distrusts the most. And for good reason. Hoping to buy a place with mortgage payments lower than rent, in an area similar to Vancouver’s hip-ish Mount Pleasant, she bought a cute little lemon yellow “coach house” with a “crawl space” in Toronto in 2006. That little lemon yellow coach house turned out to be a big fat lemon. Coach house: an outbuilding in which a carriage is or was kept. Crawl space: an area of limited height under a floor or roof, giving access to wiring and plumbing. What Hines actually bought was a renovated garage, part of which – she discovered – was built on the neighbour’s property. The gyprock on the kitchen walls didn’t meet the floor. Parts of the house that look like wood turned out to be plastic. And then there was something dead in the crawl space that had no door, no widow, no access. The space was later found to be as little as eight to fifteen inches high. She fantasized “a skinny baby. Strap a camera on its head. Send it crawling in on a reconnaissance”. The dead-thing stink, under a hot Toronto sun, was intensifying. No one would buy it from her now – not even Danny, her realtor. He had been aware of all the flaws in the reno before she bought it because he was associated with the previous owner. If this doesn’t sound funny, it is and it isn’t. Hines made her name years ago as Poschy at the Vancouver Fringe Festival; she returned as Poschy in Poschy’s Lips. That’s when I fell hard for her and her style of dark humour. As a bouffon, Hines oh-so-sweetly delivers blistering commentary on our consumer culture. She’s never whiny, petulant or belligerent; her voice is well modulated, her diction impeccable. The writing is witty and intelligent and the performance is terrific. Hines, dressed in a classy grey/black striped, body-hugging dress, wears funky, probably expensive shoes and black stockings. Her hair is perfect, the lipstick on her perfect rosebud mouth is perfect. She makes no bones about coming from a financially comfortable family or that she has family and friends to help her through this disaster. But it worries her that many – especially millennials – do not. Decent housing is almost impossible to come by at a price most people can afford. Our ‘for profit’ culture is seriously screwing us. Appropriately, Crawlspace is in The Fishbowl, a tiny venue on Cartwright Street on Granville Island. Maximum: twenty-four “owners and/or renters” ranked around two sides of the room on wooden chairs and benches. Hines sits at a desk when she’s not walking around making eye contact with everyone. It is intimate. It feels like a conversation. When she talks of rats or black mold, she looks right at you. She knows your fears. She’s pitch-black funny. Presented by Boca Del Lupo Theatre as part of its Micro Performance Series, Crawlspace is sold out. That’s disappointing for Vancouver theatregoers but probably a good thing for Hines. Finally free of that cute little lemon yellow house, she will be, according to CIBC, paying off debts – incurred preparing the place for re-sale – for the next seventy-two years! CRAWLSPACE by Karen Hines (Soulpepper). At the Young Centre for the Performing Arts (50 Tank House). To April 15. $25-$50. soulpepper.com. See listing. If you’re struggling to buy a house in Toronto’s runaway market or just coming to the realization that you will never be able to afford one, Karen Hines’s homeowner horror story is ­vicariously cathartic. Having started off as an award-winning magazine article, and then premiering onstage at Videofag back in 2015, the show is Hines’s mind-melting Kafkaesque saga about using her life savings to buy a tiny house, only to quickly become consumed by an array of unreported issues, including one stomach-churning doozy involving the mysterious crawl space. Performing in the round with the aid of chalkboard diagrams, the captivating Hines spins a good yarn. More than a kvetching session, it’s a wider commentary on the moral and systemic flaws in our economy. And her struggle to cope with frustration, unanticipated adversity and hopelessness is relatable regardless of your housing situation. Though this drama unfolded over a decade ago, the sting still feels fresh, and Hines’s cautionary tale is, of course, more relevant than ever. Her giant middle finger to the system is potent therapy for everyone feeling left behind or shut out from the dream (or nightmare?) of home ownership. Karen Hines took her first step on the property ladder in 2006 and quickly came crashing back down. 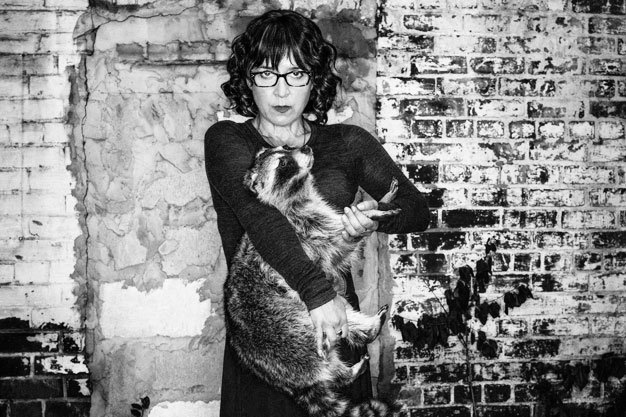 Her harrowing experience in real estate eventually resulted in a magazine article called “My Little House of Horrors” in 2009 and a semi-autobiographical horror-comedy play, Crawlspace, that premiered at Videofag in 2015. Somehow Hines is able to revisit this traumatic time in her life once again, as Crawlspace is remounted at Soulpepper Theatre as part of the company’s Solo Series, following Diego Matamoros’s Cage, and followed by Pamela Mala Sinha’s Crash and Haley McGee’s I’m Doing This For You. Since Hines first performed the play, the last two years have only seen Toronto’s real estate crisis deepen, bidding wars increase and younger Torontonians lose more hope at ever being homeowners in this city. The property ladder is escaping their grasp, as Hines describes, like a rope ladder hanging from a helicopter. She only just reached it in 2006 with her 400-square-foot lemon-yellow “coach house” like an action hero making a life-saving leap. “Coach house” is in brackets because, as Hines reveals, not everything was as it seemed with her first home purchase (as a cautionary tale, her story will certainly make you think twice before you agree that coach and laneway houses are the solution to Toronto’s insufficient supply of real estate). In a dimly lit theatre, a chalkboard and desk covered in ruffled-up papers stands upstage and, downstage, a shabby-chic trunk covered in a fur stole and pillar candles. Michelle Tracey’s set design resembles a legal office-meets-condo showroom hybrid that’s also haunted. A white chalk floor plan of Hines’ doomed home on the chalkboard echoes a nearly life-size one on the floor, turning a dream home into something resembling a crime scene. The hyperbole of this setting is perfectly matched by Hines’ careful composure as a writer and performer, revealing her story like a gothic thriller with a shadowy real estate agent, a duplicitous seller and the ever-present stench of a dead giant mammal under her house. But Hines’ wit comes out in her painfully funny writing and slow, deadpan delivery, skewering real estate speak by always including an adjective — granite countertops, nickel-plated drain, Brooklyn loveseat, twine orb — and MLS speak (“Everything has been done” becomes “Vrthng hs bn dn”). Though she makes clear that no one did anything truly illegal throughout her ordeal (which we’ll leave spoiler-free), a lawyer has checked her script and she keeps the details vague to avoid potential litigation. And just to be safe, Jessica (Sascha Cole), a law school student, is on hand to keep Hines from straying off-script: a role that made more sense in Crawlspace’s previous incarnation in which she had more to do with the audience, welcoming and seating them, passing out snacks and taking care of the space as if it was an open house. In this version, Jessica is mostly a silent and uncertain presence. In losing her life savings multiple times over, Hines says she believes the ordeal has made her a better person, or at least one that can find humour in the tragedy of her investment and reckon with the raw, human desire for shelter. There are certainly elements of schadenfreude in the appeal of Hines’ story, but she pushes its impact beyond shock value through sheer ability and mastery of her craft. This reviewer is thankful that Hines’ bad luck has resulted in this weird, eerie play and is happily renting for the foreseeable future.